I'm not sure if it's a boy thing or just a toddler thing, but Mac is obsessed with locks, hinges, latches, handles, etc. He can play with the gate in the back yard for 30 minutes (in toddler world, that's like HOURS). Open the gate, shut the gate, lock the gate, unlock the gate, open the gate, shut the gate, lock the gate... Gah! You get the idea. 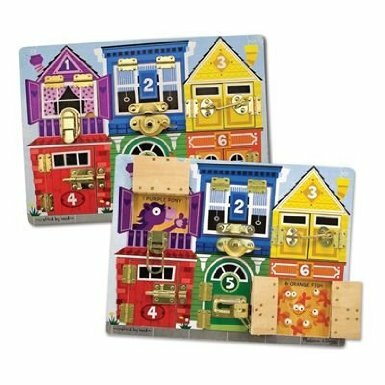 So, when I saw this Melissa & Doug Deluxe Latches Board , I thought it was awesome! All the little doors open and close with all kinds of cool hinges, latches and locks. We love Melissa & Doug toys at our house - they're sturdy and well built and I love that they're powered by "imagination" and not batteries. However, the more I looked at this, the more I thought about making something similar myself. I first saw this idea on the always-fabulous Young House Love. John and Sherry made one this past Christmas for Clara (yes, we're all on a first name basis around here - I like to think of them as my crafty blog neighbors). I took their idea and went from there. I found a few other images online to give me an idea of different things I could put on the board (there are some seriously crafty people out there!) and headed to Home Depot. I found a large board and had Ryan saw it in half and sand the edges so there wouldn't be any splinters. (I was planning on doing the sawing and sanding myself, but Ryan won the coin toss on who got to play with the power tools). I bought a variety of locks, hinges, latches, handles, knobs, etc. for somewhere around $35 at Home Depot. You can probably get these much cheaper if you get smaller versions of these items. I opted for big heavy ones. I laid them all out to get the layout right and make sure everything would fit and then attached everything with our cordless drill. It was SO easy to make. 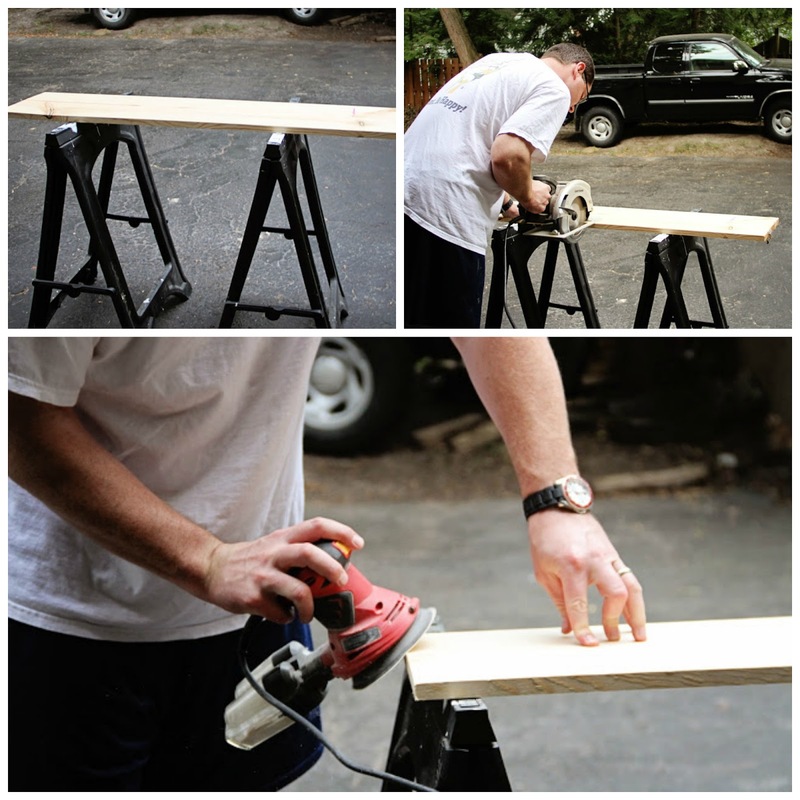 If you can operate a drill, this is a project you can do! The board is about 2 feet long and 1/2 inch thick. I didn't want a super thick board because I didn't want it to be so heavy that Mac couldn't move it around. However, with the thin board I was worried that some of the screws would go too far though it (rightfully so - they did). Luckily we have a stash of odds and ends screws at our house and I found some shorter ones, which I had to use for a few of the items. I didn't end up using the door knocker (which was the most expensive item) because the screws were way too long and I didn't have shorter ones that fit. I replaced it with a few knobs (not all that fun, but whatever). I thought about using a door knob and a light switch, but I couldn't figure out how to really make them work. Everything else worked out. I'm also going to add some carabiners to the handles to make them a little more interesting. All in all it took about 2.5 hours to make (would have been less had I not dealt with the whole door knocker fiasco and not injured myself and needed to take a break to bandage my finger and self-medicate with vodka) and cost about $35. This is obviously more expensive than the store-bought version (and possibly less cool because it has no doors), but I'm pretty proud of it. I had high hopes, but Mac is only slightly interested in it right now. But he's still so young. I'm sure within a year he'll be much more intrigued. I'm thinking of putting it away and trying it again this winter when the weather's nasty and I want something to keep him entertained inside. Christmas present! Have any of you tried this with your little ones? What items do they like the best? I LOVE this! I've heard of this idea but hadn't had time to research any how to make it so your post is perfect! Thanks for sharing and I'll let you know if girls like it too (I suspect this girl will at least!). Good for you!! That is awesome. I've been wanting to make one of these for Noah!! I SERIOUSLY need to do this for Max. He is OBSESSED with all of these things. His mind is always working. That is seriously so neat. I wonder if my 21 month old would like something like that? She's kinda a girly girl, so maybe I'll wait for this little guy to pop out + 21 months and try with him! Oh my goodness...this is GENIUS!!! Love this idea and want to copy you asap for E!! This is such a unique and cool idea! Madeline is at the stage where she loves to do the same things over and over and over again and things like locks and keys really intrigue her. I think I see a weekend project in the making! Omg! He can open and close doors for HOURS now. Best thing ever! This is so crafty - you are just good at everything! :) (This is Natalie from the Legally Married blog - I decided to start a new blog and get reacquainted with all my online friends!). 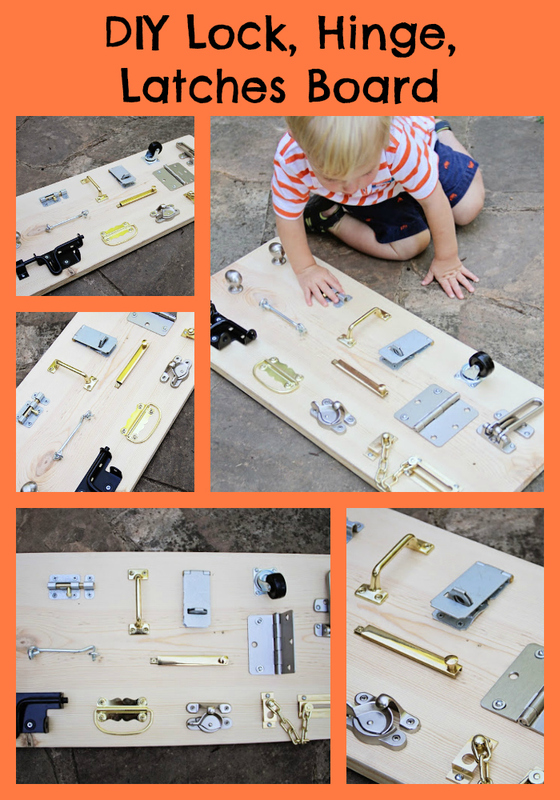 Make your child safe from hurting themselves when they are playing with locks, gates and hinges. Buy equipment that is baby safe. This is an intresting blog that you have posted, you shares a lot of things about Steel Piano Hinge,Weldable Hinges and Custom Hinges. Which are very informative for us. Great idea! I really find this blog helpful. I've ordered new gate locks and door lock for my kids room.I'm really having trouble securing that my kids won't able to exit the nursery room while I'm doing household chores. A friend of mine advice me to buy new locj=k for my gate and a good lock for nursery room. My husband customize the door of our nursery room he really ask the architect to place a fiber glass window so we can see what's the kids are doing inside the nursery room. 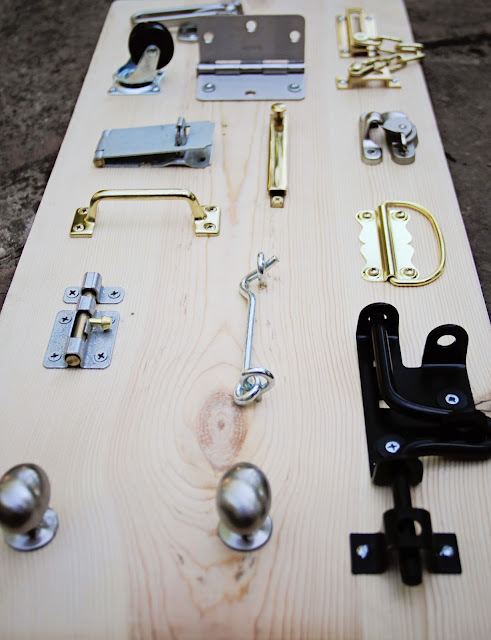 These kind of DIY lock and hinge doors can be a great piece of amusement for all. You can easily try solving the puzzles of all the lock sets and hinges that are on the board. Although, it also can be a great piece of interest for a locksmith. All the locksmiths at Locksmith Fort Lauderdale are well trained to go through any kind of lock sets repair. 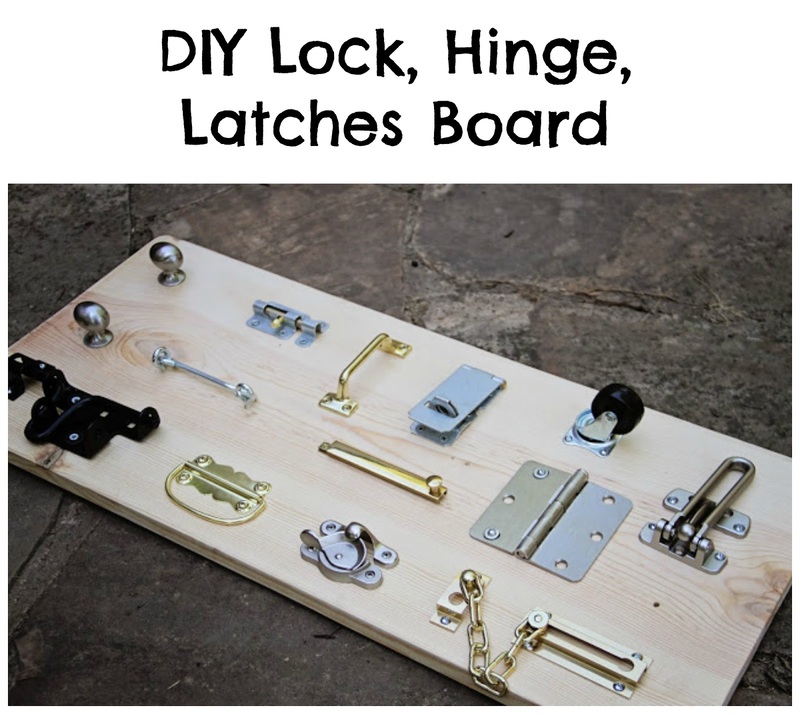 These locks and hinge board are simply great for kids as well as older people. It is a perfect puzzle set which is also a good exercise for the brain. 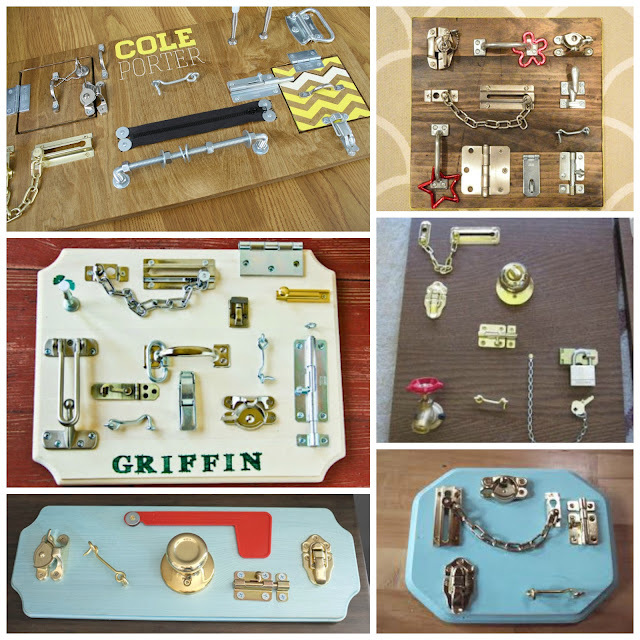 Although, any locksmith can also help you easily in organizing a good and compact hinge and locks board for the kids. How interesting! When I was a kid, I do not think I have ever played with something like that. This seems like a fun project to do for my twins as well, Jason and Mark. One thing though. Just make sure the surface is smooth, so no hands will have to suffer from any splinters!